Kind of the oldest known examples of a flag to represent the pup play community. This is still used in similar versions like the Gaydogtraining group in france for example. Not much is known from the original designer or who it was other than the comments made by the creator of the Pup Bone Pride Flag. Far as known, it is currently in the public domain for all uses. ~ Original note from Kirk “Brue” Pierce, the original designer to the Pup Bone pride flag. Now in more recent years it has been redesigned by having the stripes go sideways with new interpretations. But it still makes me smile to see the red bone symbol being used and widely identified, accepted as a pup symbol. In the end what matters to me the most is find out who you are and how you convey yourself, your pup/dog soul or Handler/Trainer skills. This is what is truly important to help make our community a safe and healthy space. Please remember there are many ways to convey your pup/dog interest that even if none of the current or available pup/Dog logo designs work for you, find something that does. Be true to yourself, your soul, as each of our pupdom journeys are different from everyone else’s. It was released to the public domain for free for all uses in May 2011. Original appearance in 2016 but its major public debut was at the Inaugural Australian Pup and Handler Competition in 2017 was designed as the next evolution to a flag that can represent pups and handlers. While keeping respect of the evolutionary path of previous versions with keeping the stripes and the red pup bone color codes and a nondescript pup head that you cannot tell what gender or sexuality is that . A guiding hand to represent handlers in the community without looks like any side, pups or handlers are controlling the other, giving the spirit of individuality and being yourself as primary focus. The redesign of the horizontal stripes to be thicker were also designed to help separate from the leather pride flag as they have been confused as the same during pride events. It was also gifted into the public domain when used as a flag in March 2017. Any use other than as a pride flag is required to ask for permission which can be found by clicking here. The original history and public domain release is missing on your description of this flag. You can verify the info below. This is the Puppy Pride Flag with all of it’s history and links to the original files. The original source files in vector (adobe, corel, etc) and bitmap (jpg, png, bmp, etc) formats are freely available for download at http://www.humanpups.com. This is the official Puppy Pride flag of International Puppy Competition (IPC) (Not to be Confused with IPTC/IPAHW). The Puppy Pride Flag is very similar to the 7 stripe design created by Jeff Hull (Grungepup Jeff) but like the first Puppy Pride Flag with the centered Red Doberman Head, this design has all 9 Black, Blue and White stripes from the Leather Pride Flag created by Tony DeBlase that is a symbol for the leather community, which encompass those who are into leather, Levi’s, SM, BD, uniform, cowboys, rubber, and other fetishes. 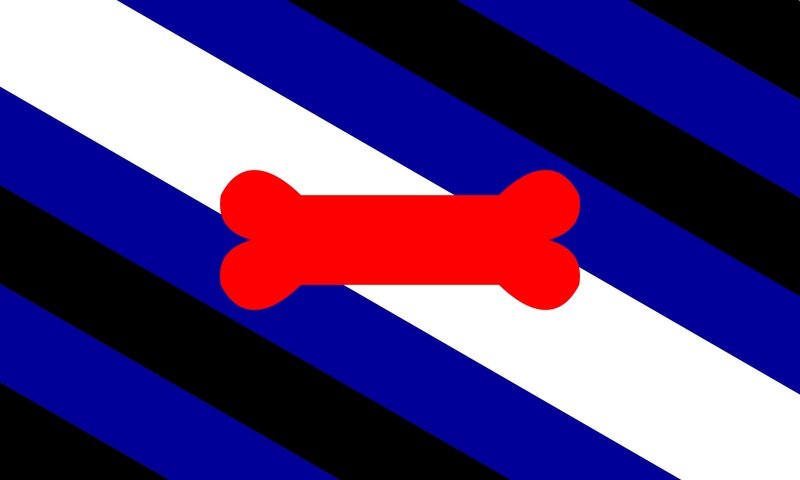 Unlike previous flags, the White Stripe in this design is 1.5 times wider than the other stripes to represent the broadness of the puppy community and as in Grungepup’s design, the stripes are set on a 30 degree diagonal reminiscent of the boy flag designed by Keith P. to indicate a new direction. Like Grungepup’s design, the blood Red Bone in the center is reminiscent of the puppy pride flag designed by Kirk “Brue” Pierce which replaced the centered red Doberman head of the original Puppy Pride Flag with a centered red bone since the centered red Doberman head was too breed specific and turned the stripes sideways. However, the centered red bone used in this design is larger to be more prominent and represents the unconditional, non-judgmental heart of the puppy.